The Amazing Story of the Saint who knew Mary Magdalene. 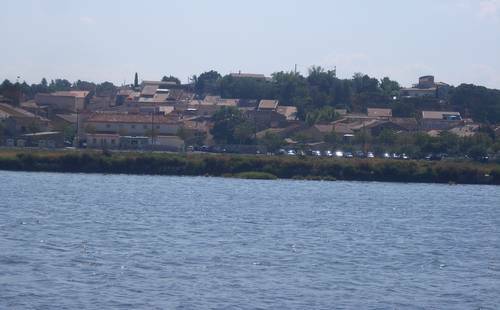 The seaside town of Peyriac de Mer is situated beside the Etang de Sigean et Bages, immediately south of Narbonne, about half way between Bages and Sigean. In Roman times the water level of the étang was higher than it is now, and so the étang served as a huge port for Roman Narbonne, with many smaller ports on it, such as Bages and Mort Mahon at Sigean, where Roman jetties still exist. At the same time, Narbonne, and places like Bages, Peyriac and Sigean were open to the sea; the sand-bar of today from Gruissan to Port la Nouvelle did not exist two thousand years ago. In 33AD Mary Magdalene and Jesus came to this region, to Rennes-les-Bains in the Corbières. At the time there were no public baths in Narbonne, so the wealthy Romans from Narbonne went to the baths at Rennes-les-Bains. Their friend Claudia Procula would have known of the baths, for she was brought up in Narbonne by an aristocratic family, and she advised Mary Magdalene and Jesus. The best route to Peyriac is; take the Perpignan road from Narbonne, then turn left for Bages, from there follow the sign-posts to Peyriac. You cross the marshes and salins or salt pans on narrow tracks, with flamingoes and salt pans all around. 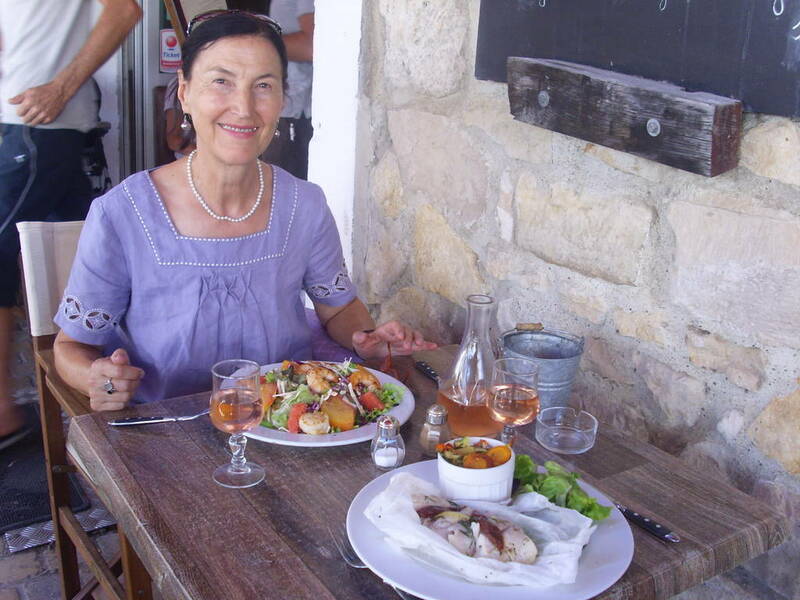 There is a good atmosphere at Peyriac de Mer. 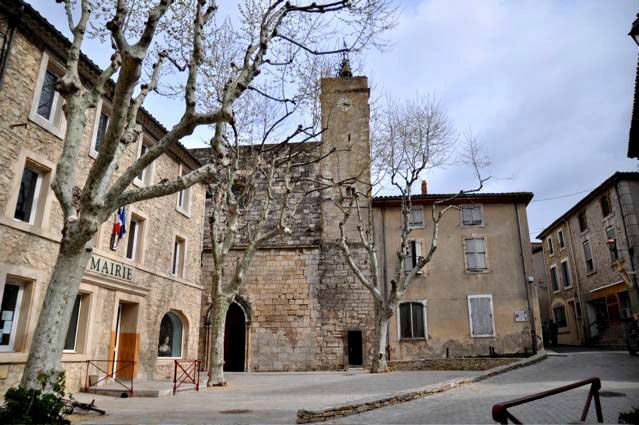 One parks down by the etang and walks up to the main square, where is a handful of shops, the Mairie, the church and the café. 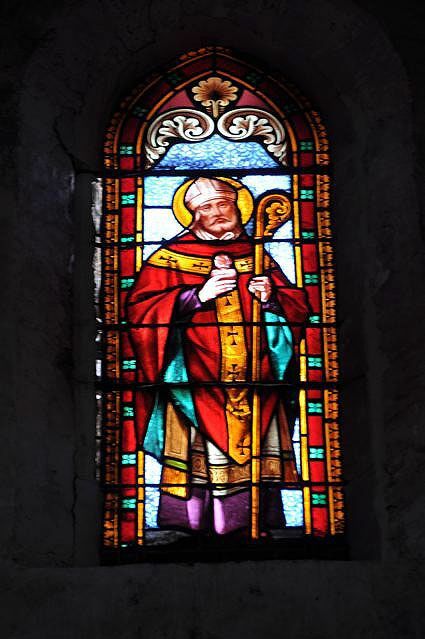 But it was the church I was really interested in and I thought I might find some more information about St. Paul Serge, who became the first bishop of Narbonne in 50AD, after landing on the coast near where is now Peyriac. 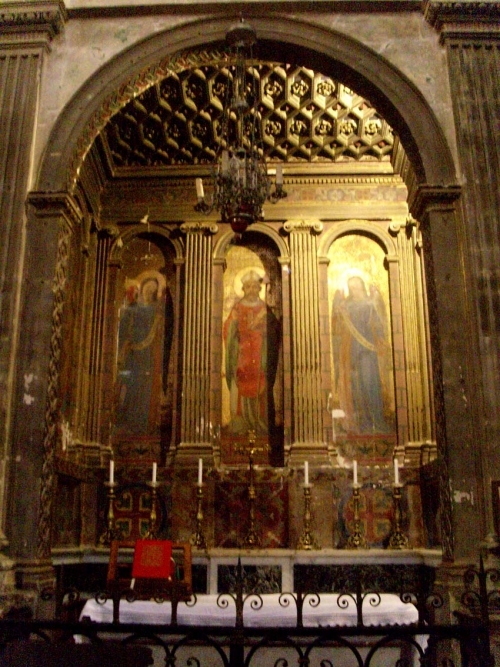 The church at Peyriac is open all day and contains a wealth of statues and paintings . . . but it is dedicated to St. Paul the Apostle, not Paul Serge. 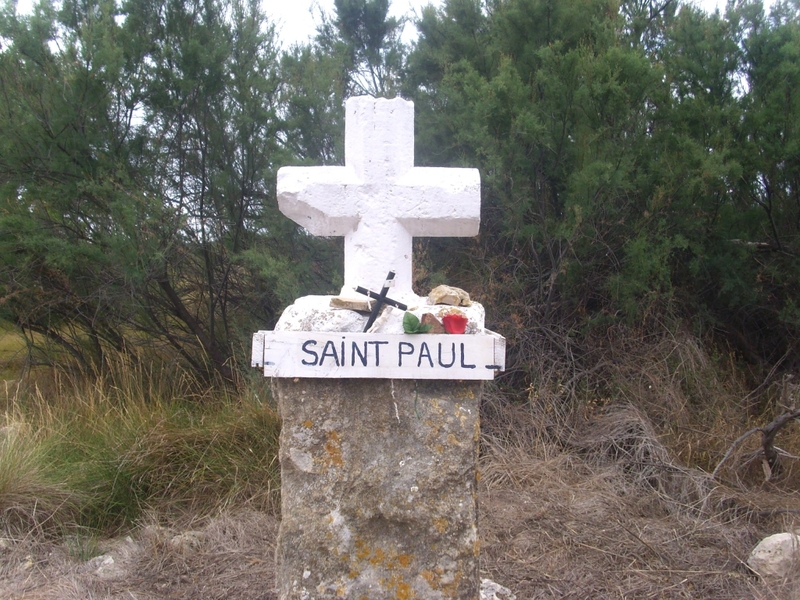 According to legend, Paul Serge went with St. Paul the Apostle to Spain before coming to France. There is no mention of this in Acts, however. The church opposite the café . . . the two Marys at the Crucifixion . . . and a bishop. In early Christianity the word "bishop" meant "leader" but later artists assumed that the first century "bishops" wore mitres, as did the later conventional bishops. Paul Serge appears in the Bible as Sergius Paulus, the Roman governor of Cyprus, who was converted to Christianity by St Paul of Tarsus. (Acts 13, 7.) The date of this event has been calculated as 47AD, therefore he would not have come to Peyriac in 250AD as stated in the leaflet in the church! He came to Narbonne around 50AD; Mary Magdalene and Jesus were living in Languedoc at the time. The Christian community around Narbonne and the Corbières at that time was small - I have no doubt they would have known each other. Way back in Cyprus Paulus Sergius was converted and then came to the Narbonne region to "evangelise" it. Why did he choose Narbonne? Simply because it was the Roman capital of "Transalpine Gaul" as the Roman called the Gallic area on the other side of the Alps than Rome? Or maybe he choose Narbonne because he had heard there were Christians already there. If so, the only ones history has ever heard of were Jesus Christ, Mary Magdalene and Claudia Procula. 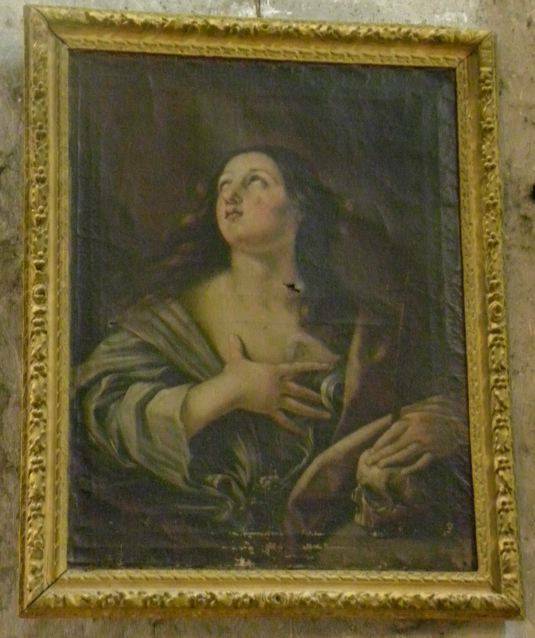 There is not much about Mary Magdalene in today's church at Peyriac however; she appears only on the triplych about the crucifixion. 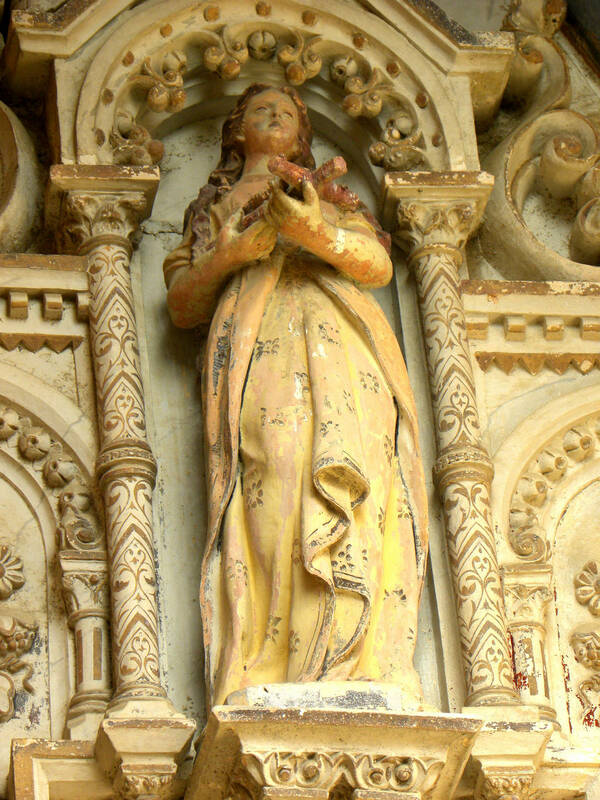 Her image can be compared to that on Mary Magdalene on the church porch in Rennes-le-Château, for they both have a "serpent" on the front of her robe. These representations were the fashion at the time both churches were renovated; late nineteenth century. This error in the date St. Paul Serge landed, 250AD instead of 50AD, is because of a mistake in the writings of Gregory of Tours, from the 6th century, who described seven apostles "sent from Rome" to convert Gaul (Roman France) in 250AD, and the list included St. Paul Serge, and showed him as a colleague of the first Bishop of Beziers, Aphrodise. Aphrodise, with whom Paul Serge is connected, arrived in Beziers around 250AD, from Alexandria, but it's not true they were contemporaries. But who was therefore this little tree-frog sculpted in stone in the font of the church of St. Paul in Narbonne? A rash punishment for disturbing the mass with his croaks? The legends says that in the first century of the Christian era, the bishop Paul Serge had converted the daughter of the Consul of Narbonne. Denounced, then judged, the young Danaîdée refused to abjure her religion and marry the Emperor Justinian. (Justinian the Great, was the Eastern Roman Emperor from 527 to 565 so there's some confusion here!) Danaïdée's father, furious, condemned her to death. But when she was thrown in the sea. Danaîdée changed into a tree-frog and fled. 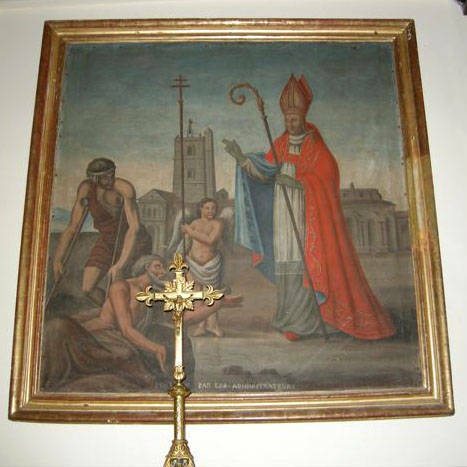 The bishop Paul Serge continued to evangelise, to the great displeasure of the Consul, who offered the inhabitants of Bages a reward for killing him. 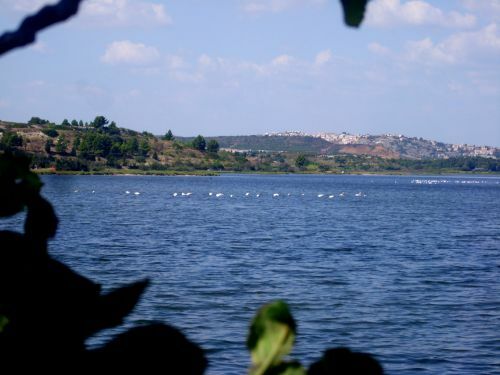 One day when Paul was fishing beside the étang (which, remember, was the open sea at the time) the people of Bages seized him. To mock him, they offered him a chance to save himself . . . to carve a boat in a block of marble. But to the great surprise of the people, the bishop succeeded, in a few hours, with hits from a hammer, in forming a skiff as light as wood. And slowly, it drifted to the open sea. Just then, a little tree-frog jumped on the prow of the boat to show him the way. And save him from certainly drowning. 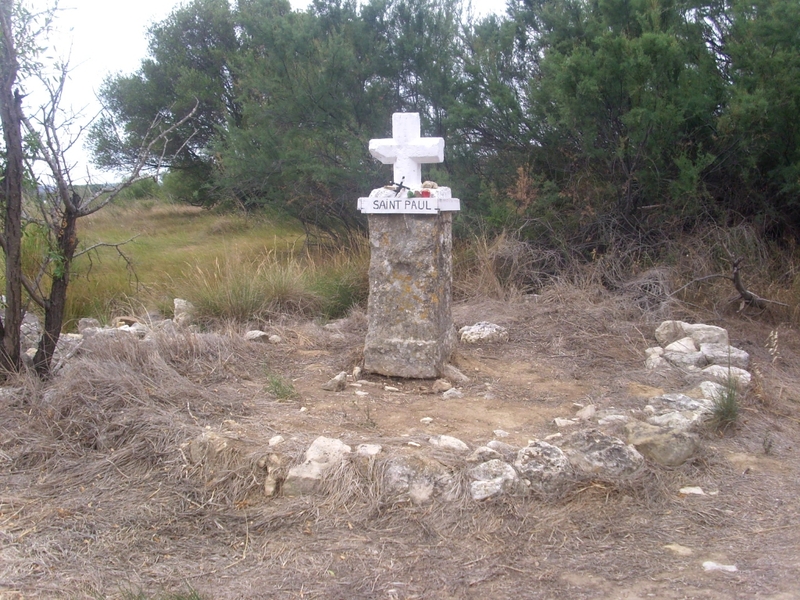 The cross at Peyriac erected at this spot is not on the coast but about a mile inland. This is what convinced me it really was the place where Paul Serge came ashore, for the étang was bigger then, the level of the water was higher. So, I walked up the track, passing a tower on the left, on the road through La Horte, until I came to the cross. Beside it are some stones that I thought might be the remains of some sort of building. 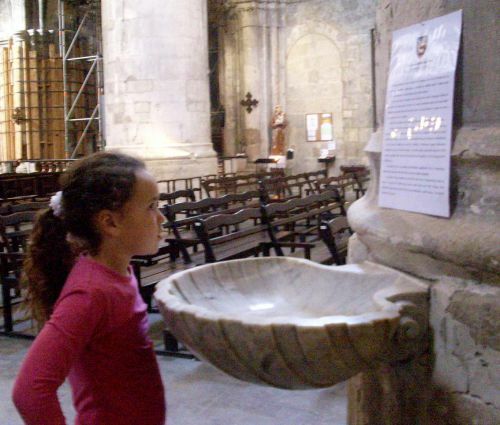 And I was right, for the church in Peyriac told us the base of the cross was an old Visigothic pillar and at the spot "the ruins of a former Visigothic place of worship and a few communal graves can be found there too." The chapel and 13 graves were found in the vineyard behind the cross. Some crosses in the museum at Peyriac might have come from there. The museum contains mainly the remains of a Celtic Oppidum beside the sea; when the Romans came to the region in 118BC they automatically lived there, for they had been trading with the Celts for many years. If you would like to see pictures of the many finds in the museum, click here. 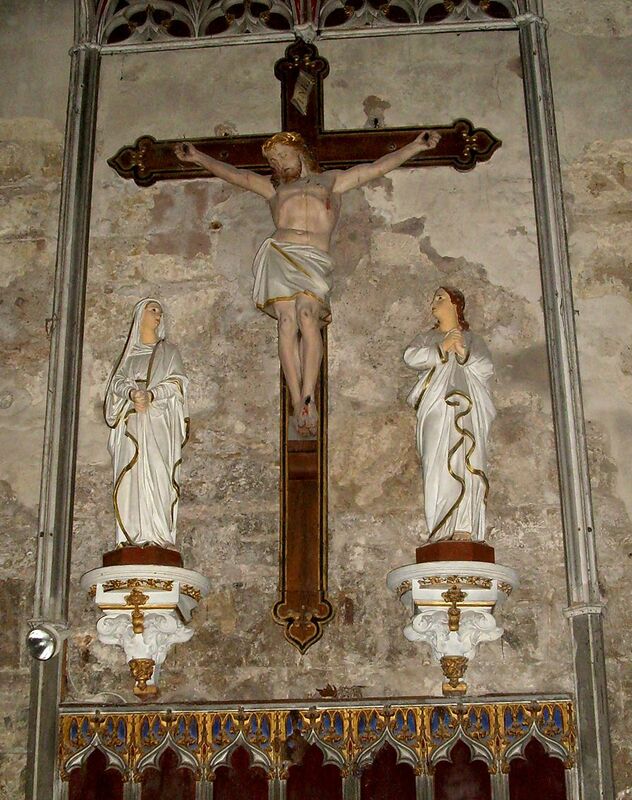 The cross itself on its pillar is comparatively modern, and probably re-used, for during my 2013 visit, I saw some markings on the back of it dating it as early 19th century, and somebody had placed a crucifix at the base of it. 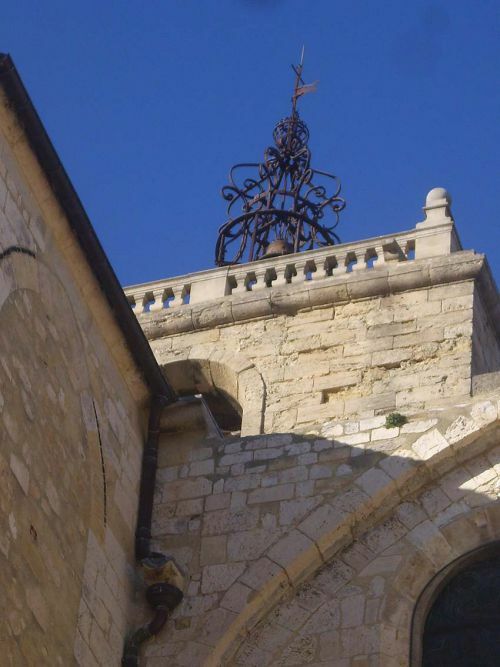 One finds the church in Narbonne behind the Centre Hospitalier General on the Boulevard du Docteur Lacroix in Le Bourg. In Roman times, Narbonne was only on the north side of what is now the Canal and what was then the River Axat, not the south; south of the river was open ground. Very sensibly, the dead were buried outside urban centres. St. Paul Serge was buried there in a graveyard that extended outwards from the south bank of the river. The current church was built over his grave, and became a place of worship around 250AD. 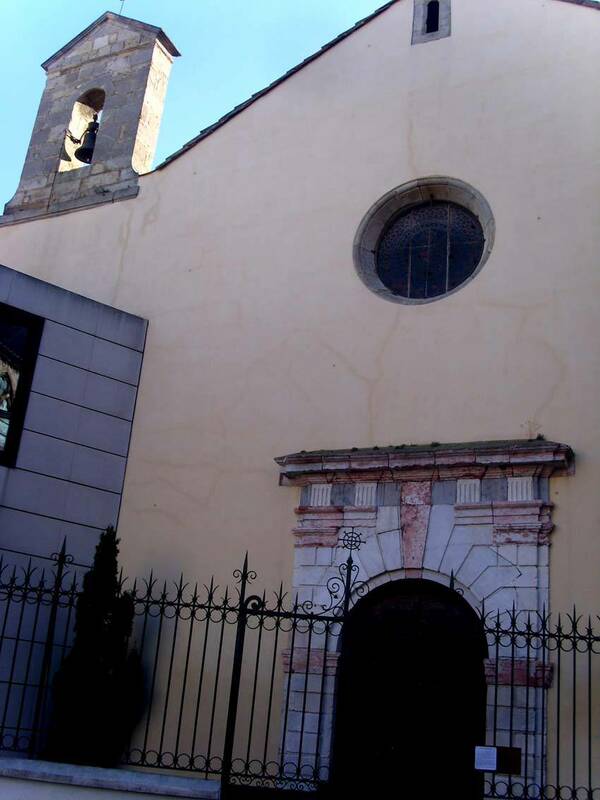 At that time Christianity was growing rapidly and the third century Saint Sebastien held prayer meetings in a private house where now stands the Magdalene Tower in the Cathedral complex, and probably in his own house too, the Roman remains of which are under the church dedicated to St. Sebastian. 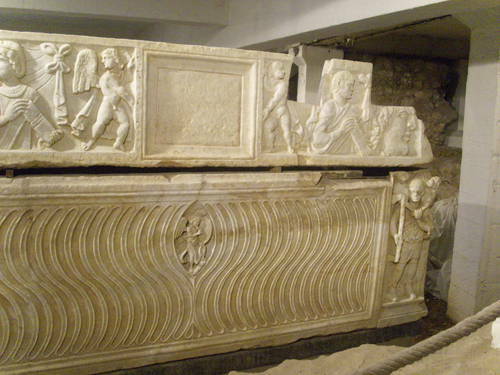 In the walls of the church are embedded old gravestones, with Roman or Uncial (5th century) writing on them, from the cemetary next door, and in the crypt of the church (ask the caretaker to unlock the door for you) are Roman and Visigothic stone coffins. 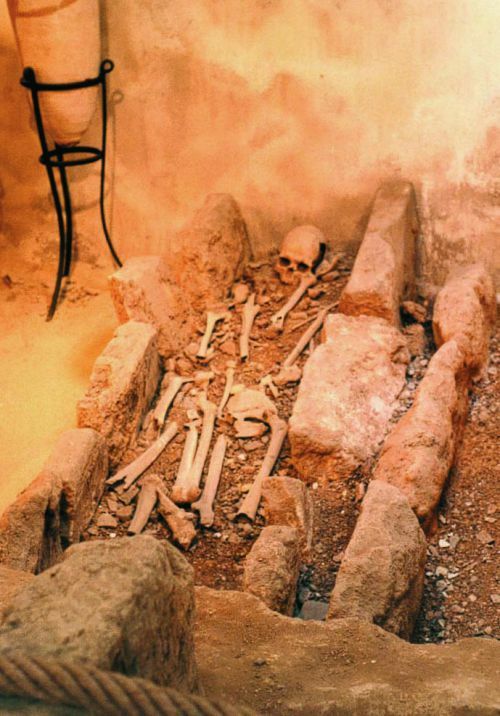 Also were found bones of children aged up to 4 years, interred in amphores; this was well-known in pre-Christian Roman days. 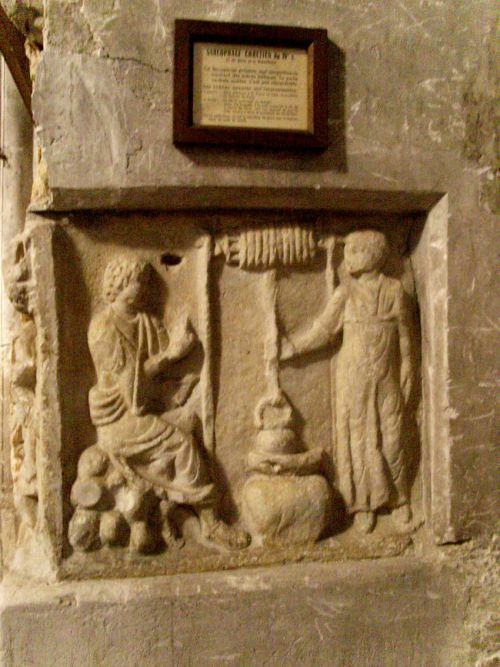 Above; a Biblical scene - Jesus and the woman at the well - carved on a stone coffin inset in the wall of the church and a tomb in the crypt, complete with skeleton. Another coffin is most interesting as it contains both Roman (or pagan) and Christian symbolism on it and is dated around 250AD. However, no-one is mentioning the tomb of St. Paul Serge, even though it's said he was the First Bishop of Narbonne and there is a chapel to him in the church. 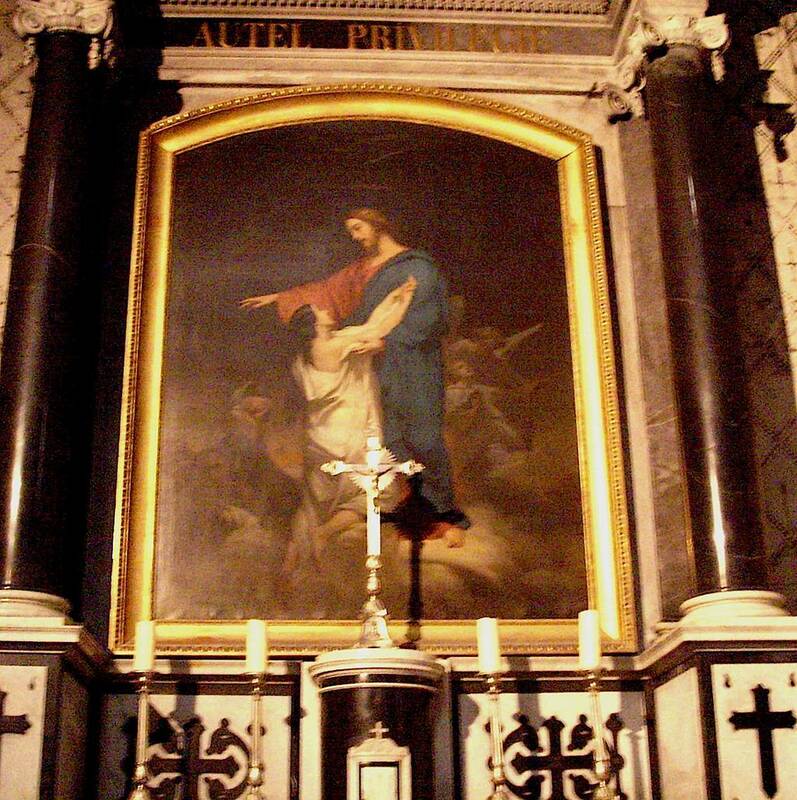 In January 2015 I discovered however, that his body lay underneath the main altar for hundreds of years, but his remains were burnt during the Revolution, when many churches were ransacked. Now only a few fragments remain. Which brings us to the reason we are so interested in him and his connection with Rennes-le-Chateau. Jean Alain Sipra, an architect who lived at Rennes-le-Château, wrote a book called "Rennes-le-Château, Du tresor des Wisigoths au secret de l'abbe Sauniere." He described how an aerial photograph revealed the outline of a huge building on the plateau to the south of Rennes-le-Château. He compared the description of this with the description in Raban Maur's book, the Life of Mary Magdalene, written in the 9th century, and concluded the only place corresponding to the great mausoleum described by Raban Maur, where Mary Magdalene was laid to rest, is the building to the south of Rennes. Sipra called this never-excavated building a martyrium, and he believed that both Mary Magdalene and St. Paul Serge were interred here as well as the Visigothic Kings and Queens of Rennes-le-Château. Amazing? Bizarre? Well, one never knows, legends grow magnificent, like mushrooms; but one legend in our region here tells us that Paul Serge was not converted by St. Paul in Cyprus, but by Mary Magdalene herself (Apostle Paul hated women and would have taken the glory without doubt) while a second legend tells us that after Jesus died, here in the Languedoc, Mary Magdalene married St. Paul Serge and went to live with him in Narbonne. She is remembered in yet another legend, as late as the 13th century. Alphonse de Provence, duc de Narbonne and brother of Saint-Louis, went to war against the king of Castille. Conquered, he was kept prisoner in a tower in Spain. During the long months, he prayed to Mary Magdalene for his freedom. One night, after a plea more fervent than ever, the saint appeared and freed him from his irons and placed a blindfold of silk over his eyes. 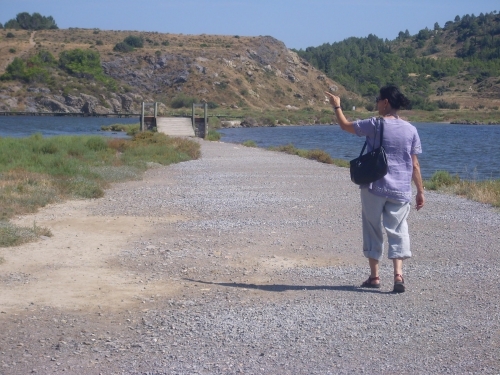 She took him, evading his jailers, to the etang de Bages. "Reknowing life", he decided to erect a cross in this place, at the same spot where the saint left him. I first saw the church of St. Paul Serge in 2003, but the statue I saw then of Mary Magdalene has now disappeared. The guardian told me; "It has now been taken down. I don't know why." However, we found a picture of her in a dark corner, and another above the principal altar, showing the Easter Monday scene where Mary wanted to embrace Jesus. It was very dark there. 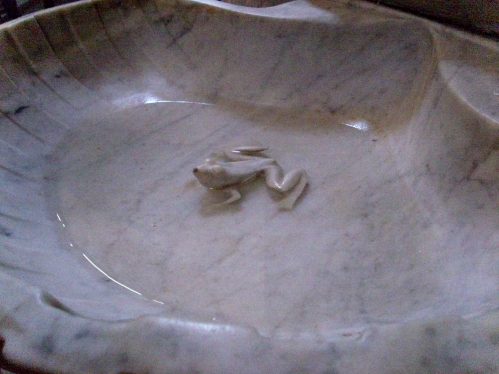 Meanwhile the little frog who guided St. Paul Serge to Peyriac de Mer is immortalised in the font of St. Paul's church . . .
St. Paul Serge's feast day is 22nd March. 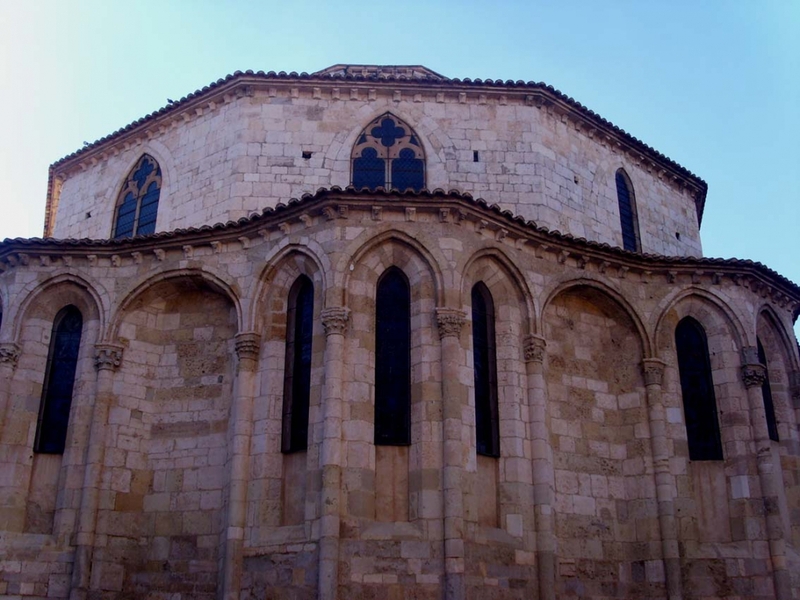 In the 9th century his church became popular with pilgrims going to Compostella, as it was positioned on the great Roman road, the Via Domitia going from Italy to Spain, not far from its junction with the Via Aquitana, that led from Narbonne to Carcassonne, to Toulouse and eventually Bordeaux. The bell tower has been visible to pilgrims for more than a thousand years. In Roman times, the grave of St.Paul Serge (above which today's church was built) was not far from the junction with the Roman Via Domitia, going south towards Spain, and the Via Aquitana, heading west towards Carcassonne, Toulouse, and ultimately the Atlantic coast at Bordeaux. Thus a major pilgrim route passed St. Paul's burial place and later church. When a pilgrim route passed a major church on the way, often accommodation was built, for pilgrims could sometimes be wealthy. Because some people were on a pilgrimage hoping to evade dying from some illness (as happens at Lourdes still today) this accommodation was often, or included, a hospice. Sometimes there was a chapel beside it, to say prayers for those who died on their pilgrimage. 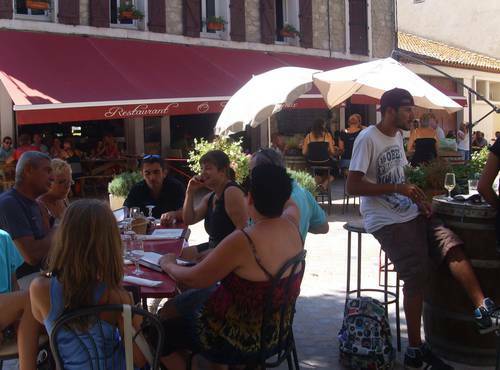 Close to St. Paul Serge's church in Narbonne today is one of Narbonne's two major hospitals. And beside it is a chapel. Still today. St.Paul Serge himself may have been a healer; many early Christians were. Inside the church is a rather fanciful painting of him at Narbonne healing people; as a bishop, with his church as it is today in the background! So a brief history of Peyriac led us to some amazing finds. 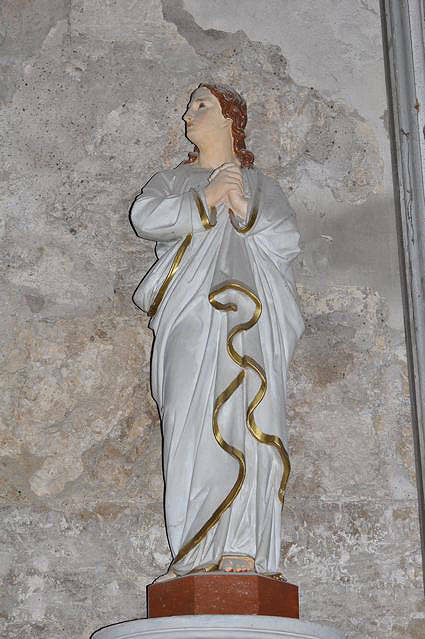 There is a local rumour in Rennes-le-Château country that Mary Magdalene married St, Paul Serge after Jesus died in 63AD. It's possible. And yet more amazing history about early Christian Narbonne can be found in my Claudia Procula book. Click here.